Which is the best Isle of Wight beach for...? On your Isle of Wight holiday, you don't want a romantic and inaccessible beach if you are taking a dozen children to the seaside. Equally, you don't want to be hit in the face with a frisbee and then chased by a stray dog whilst proposing to your fiancee. So which is the best beach for toddlers, teenagers, children, sunsets, swimming, rockpooling, surfing, kayaking and other situations? We've assembled an esteemed panel of judges, including me and er...well, I did ask my wife about a couple of them and I might have mentioned it to my mum. Roll out the red carpet and prepare your applause for the The Isle of Wight Guru Beach Awards. I've been agonising about this one, but Sandown has a lot to offer toddlers and is a worthy winner. There's an excellent playground in Sandham gardens towards the Yaverland end of the beach, which is also near to a toddler friendly cafe at Brown's Golf Course. Sandown Pier has some indoor entertainment suitable for younger visitors. There are toilets and parking nearby, for those endless trips to and from the beach to find missing shoes and teddies. The water is also clean, as it regularly wins blue flags for cleanliness and the sand is golden (ish) and attractive. Plus, dogs aren't allowed on Sandown beach in the summer which means you won't have to tolerate some huge great animal sniffing your child and then marking its territory in their sandcastle. Appley at Ryde is another good choice - there are two modern playgrounds on the Esplanade, toilets and parking as well as a paddling pool and a huge great sandy beach. 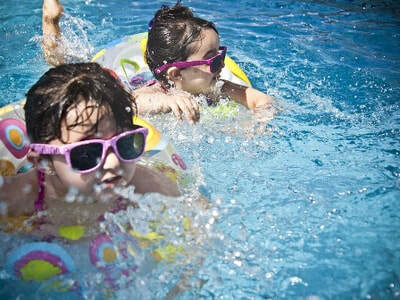 See our guide to days out for toddlers for more ideas. 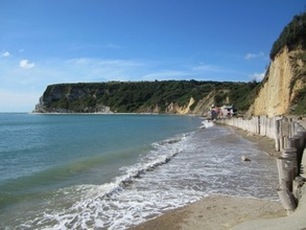 Shanklin is good for swimming with generally flat water and a sandy bottom (which is also what you get when you sit on the sand). There are pedalos and similar floating things to hire, as well as an array of booths selling sugar in various shapes, as well as chips served with extra chips. Shanklin's esplanade has a mini selection of fairly tame funfair type amusements plus a large crazy golf. There are toilets at both ends of the beach (the ones nearer Sandown Pier are better), plus a big car park right by the seafront. All in all, ideal for junior school aged children. 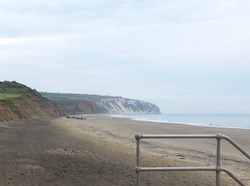 When I was a teenager, we only really visited one beach - Hanover Point - also known as Compton Bay or sometimes Shippards Chine. There aren't many facilities, but there are waves for splashing around and bodyboarding and plenty of space for a barbecue or football at low tide. Evenings at Compton are ideal for angsty teenage guitar strumming and songwriting. See our guide to days out for teenagers for more ideas. 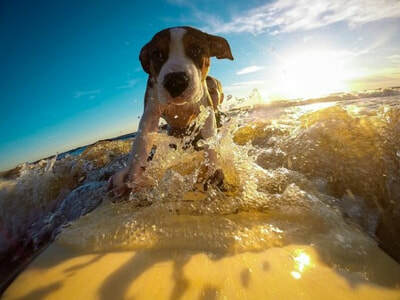 Between May and September most of the Isle of Wight's busy tourist resort have a beach dog ban (Sandown, Shanklin, Ventnor and others). Anyone flouting the ban is liable to ensure a number of tuts, muttered complaints and numerous raised eyebrows. However, there are a handful of Isle of Wight dog friendly beaches all year round. ​My vote goes to Chilton Chine, which is a quiet beach near to Isle of Wight Pearl on the Isle of Wight's south west coastline. There's a (currently) free car park next door to Isle of Wight Pearl and then a few steps down. The cliffs are crumbly and supposedly full of dinosaur fossils. Please don't allow your dog to eat the dinosaur bones. 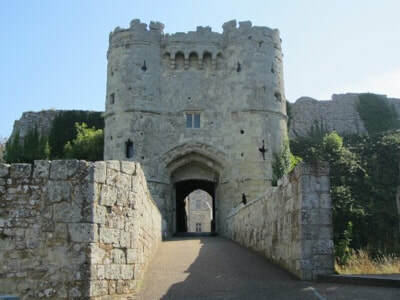 If you are a wheelchair user, or you are planning day trips with a wheelchair user then you'll know that even minor obstacles can scupper the day. Ventnor is one of the most accessible spots we've found. There is usually space in the car park at the end of the Esplanade (the Haven Fishery end rather than the Spyglass end), there's a disabled toilet, there are plenty of places to admire the view and at least one of the cafes is accessible (we have used Besty and Spinky's but I think others are accessible). In the past we've taken a wheelchair partway down the slope which leads to the beach at Ventnor with the rest of the party sat nearby. 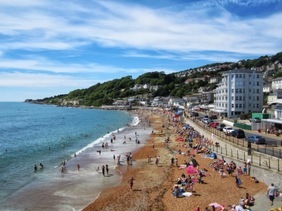 There's also a glorious walk along the seawall from Bonchurch to Ventnor which is step free. There's a helpful list of public toilets and RADAR key advice on the Isle of Wight council website. If all your friends are uploading tedious Facebook albums of exotic foreign holidays, take a few photos of Whitecliff Bay. It is a properly stunning bay, backed by trees which looks almost foreign on the right day. Reality will strike when you get in the water and realise it isn't the Mediterranean. 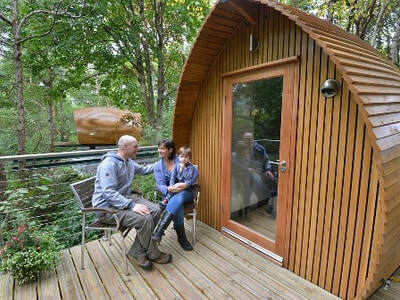 You can even stay at an adjacent holiday park. Another one which looks like a foreign island on a sunny day. The sand is supposedly imported, so in a way it is foreign. My dad once found a full size NOBO flip chart in the water at Priory Bay once, which was presumably thrown overboard by someone who was bored at a team building day on a yacht. This one is a tough one to call, and you've got to get it right if you are proposing. I spent many nights lying in bed wide awake trying to decide between Compton Bay, Thorness Bay and Gurnard. 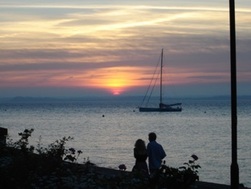 Gurnard is ideal for finding a bench, opening a punnet of strawberries and admiring the yachts passing on the Solent. However, it isn't quite as remote as the other two because it is backed by massive houses owned by bare-chested men who like to sit on their balconies. I fear this might prove a bit distracting. Thorness Bay in itself isn't a stunning beach - it's fairly scrubby, but at night it has really lovely sunsets (read about our visit to Thorness Bay). The downside with Thorness Bay is that you have to navigate your way through a large caravan park with a one-way system to get to the shore, which might be a mood killer. So, my vote goes to Compton Bay. You can even copy my idea of spelling out a romantic message in the sand and wandering along the cliff top. Every mainlander I've ever met seems to have been to the Isle of Wight aged 11 on a school trip. The conversation usually then turns to a discussion of what is left of Blackgang Chine and the fact that they bought a glass shape full of sand from Alum Bay (they'll then ask how many people live on the Isle of Wight and whether you need a passport to visit). ​The amusements and the chairlift haven't changed very much over the years, and they still sell sand to tourists visiting an Island full of sand. Now why didn't I think of that? 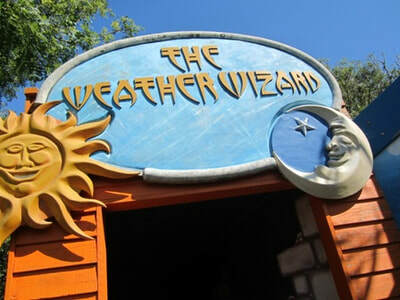 Some say that to get a feel of what the Isle of Wight was like in the 1970s, you need to visit the Isle of Wight today. This nonsense is obviously not true and is disputed by Islanders, very few of whom are still wearing flared trousers. 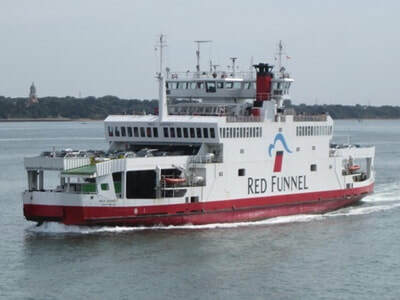 Nowadays the Isle of Wight has got it all - hot and cold running water, colour television, even escalators (or "magic moving stairs" as they are known locally). Anyway, if you want to sit on an esplanade, admire a beautiful view, eat chips and reminisce about how things used to be, then I recommend Ventnor. I might sound a little sarcastic, but it really is one of my favourite places on the Island. I am certainly not a pro-kitesurfer, but I can speak with authority that they do tend to congregate at Brook Chine, which is on the Isle of Wight's pretty south west coast. The coastline tends to get the best waves so you'll see people taking off pretty regularly. It does make swimming at Brook Chine a bit terrifying as there is always a slight right that you might be decapitated by a giant swooping kite, or perhaps just get clobbered round the head with a board. 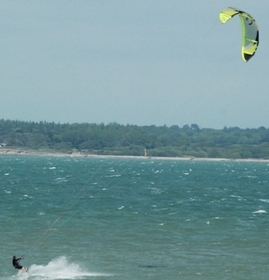 I've also seen kitesurfers at Gurnard who were hurtling off towards Southampton as if they'd just heard there was a closing down sale at Quiksilver. I'm no expert, but it seems logical that the best places for kayaking will be the places where kayaks are available for hire or where outdoor pursuits are taught. 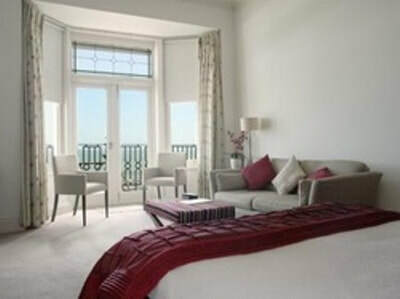 Freshwater Bay is good fun for those with a bit more experience and a sense of adventure. 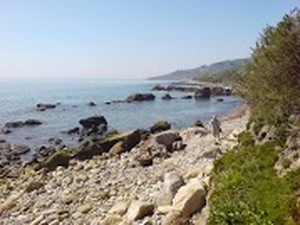 There are several caves hidden along the coastline which were supposedly used by smugglers, as well as Watcombe Bay which is only accessible by either sea or abseiling. My kayaking trip around Freshwater Bay was hampered slightly by my appallingly weak stomach, but it was nonetheless excellent. For a more serene kayaking experience, I would consider St. Helen's where a company called Tackt-Isle is based. The water is ankle deep and rarely manages anything more than a tiny wave, and there's a massive great fort in the sea to look at (it was built by Lord Palmerston who feared the French were coming). 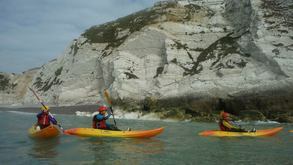 Around Shanklin and Sandown you will find places to hire kayaks for a bit of holiday larking. The water's a bit deeper than St. Helen's, but it is pretty serene usually. 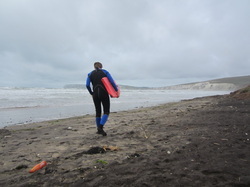 Personally, I like swimming at Compton Bay because I enjoy leaping into waves which are strong enough to knock me over. However, on paper at least Sandown is much better and so it should really win our award for the Isle of Wight's best beach for swimming. The water has won Blue Flags for cleanliness, so you will hopefully be the only floater in the sea. The seabed is sandy, which is nicer than stubbing your toe on a rock and the water goes out at a steady gradient. 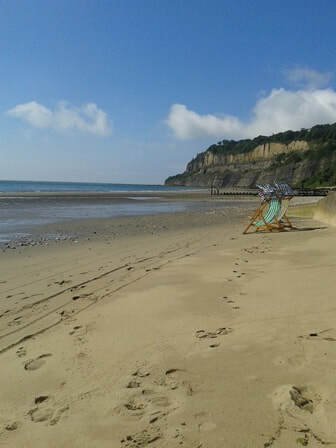 For more on the Isle of Wight's best beach for swimming, check out the blog. If you're looking to kick a ball around, fly a kite or throw a frisbee without hitting someone in the face then try Appley at low tide. The beach goes on forever, gradually turning from soft sand to that slightly harder stuff which is a bit less pretty but is much easier to walk on. At low tide you will also find lots of sand and not too many people at Yaverland near Sandown. Whilst surfing requires time, effort and lessons before you get to an enjoyable level, bodyboarding just requires an ability to lie down and shout 'wooohoooo'. For such reasons we usually stick to bodyboarding, which we've had most success with at Compton Bay. The Hanover Point end of the beach tends to be a bit rocky, but further along there are often decent waves, particularly if you are man enough to go into the water on a windy day in winter (which I'm not). Check the surf forecast before you go. Isle of Wight residents tend to fall into two camps. Some enjoy looking out at miles and miles of nothingness, which is generally what you get from Ventnor, Shanklin and the Military Road (one friend even remarked to me that they couldn't bare to look at the mainland...). Others prefer to look out into the Solent, which is constantly busy with posh people on yachts, vast container ships delivering plastic junk from China, cruise liners, kitesurfers falling over and yobbos on jetskis. On a warm evening we like to sit in one of the bus-shelter-esque structures on Cowes beach and watch them all sailing past. If you've got nothing else to do you can Google the names of the container ships and work out where they are heading. Bembridge is the undisputed champion here. ​You might be able to catch crabs (arf arf) at St Helen's or Freshwater Bay (the bit round the corner from the main beach), but Bembridge is the best Isle of Wight beach for rockpooling. Bembridge also has a lifeboat station which you can visit. Bembridge is a wide beach, which is really shallow with loads of rocks which appear at low tide. There is also an RNLI shop nearby which, last time I visited, was selling fishing nets. 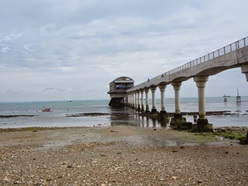 There's also a lifeboat station at Bembridge which is featured in our free days out on the Isle of Wight. 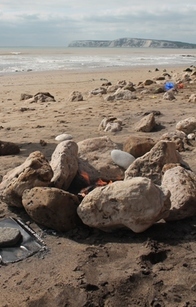 I thought twice about recommending a barbecue spot on the Isle of Wight, as there are some uncivilised folk out there who leave used disposable BBQs on the beach and happily trot home. The clue is in the word 'disposable', buster. Equally, there are some people who start up huge fires when there is a strong wind on a crowded beach, so that everyone else suffocates. As long as you aren't one of those people, I recommend Compton Bay for a barbecue on a warm summer evening. There are no bins at the Compton Bay, so take a bin bag with you. The National Trust throws its hat into the ring by claiming that "The best place to go looking for fossils is on our coastline in Compton Bay." Dinosaur Isle’s organised fossil hunting tours – which you would hope would visit prime spots – cover beaches including Brook, Yaverland, Compton Bay and Shanklin. Finally, a young girl called Daisy Morris made global headlines when she found a previously undiscovered species at Atherfield (it was named Vectidraco daisymorrisae in her honour). So, where does that leave us? You could conclude that half the Isle of Wight is prime fossil finding territory - which it probably is. The answer may be that it depends whether you want a family friendly organised jaunt along an accessible beach or a spot which hasn't been scrutinised over and over again in recent weeks. I've picked Yaverland as it seems to be a very popular spot for tours, but if a palaeontologist picked an intellectual fight with me, I would certainly lose. People that sit on busy beaches strumming a guitar are about as welcome as a smoker at a fire alarm factory. ​The rest of the world doesn't want to hear your half-decent attempt at Good Riddance (Time of your life) or Wonderwall. If you are in the mood for some angsty song writing, you will want to find an isolated spot, which will most likely be somewhere along the South West coastline (it gets very quiet from Brook Chine down towards the south of the Island). We like Binnel Bay (see our interactive beaches map) which hardly ever has another soul on it, and has plenty of crashing waves to drown out your warbling. The Isle of Wight doesn't have an official naturist beach, as far as I'm aware (I'm fairly sure the 14 year old version of me would have known about it). However, the unofficial option seems to be Blackgang on the South Wight. It's not the easiest to access but there's a car park on Old Blackgang Road. 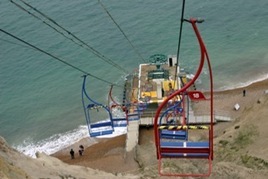 A word of caution though - don't confuse Blackgang beach with Blackgang Chine, which is a children's theme park. No-one wants to see your wobbly bits as you slide down the water ride or wander round the hall of mirrors. I'm no fishing expert, but I have seen anglers lined up in a long row at Whale Chine/Atherfield. I'd assumed they were just avoiding their wives/husbands but it turns out they actually had a decent chance of catching some fish. Various guides I've read online have confirmed that it's a recommended spot. 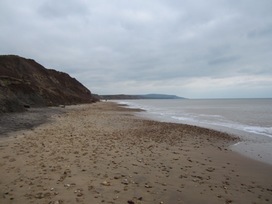 The steps have gone at Whale Chine, so you need to access the beach from Atherfield unless you are also an abseiler. 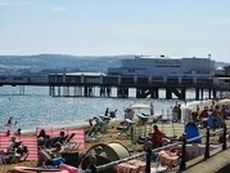 Other guides recommended one of the Isle of Wight's remaining piers (Sandown, Ryde or Yarmouth).